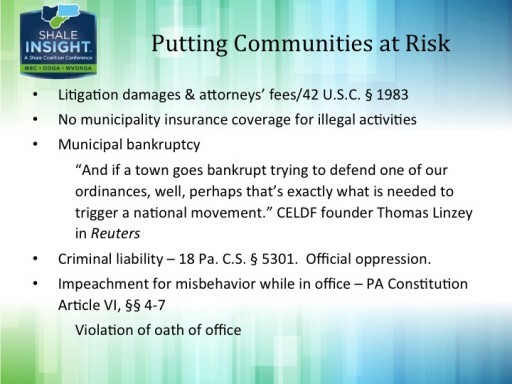 Kevin Moody, General Counsel for PIOGA just gave attendees at Shale Insight a primer on the Community Environmental Legal Defense Fund (CELDF). 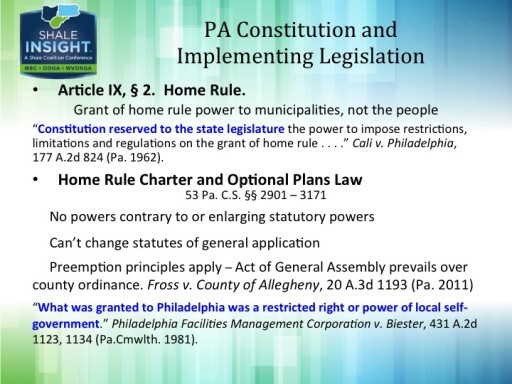 The CELDF has no more effective counter than the good folks at the Pennsylvania Independent Oil and Gas Association (PIOGA). Attorney Kevin Moody, their General Counsel and Vice-President for Governmental Affairs, has helped beat the CELDF in court. 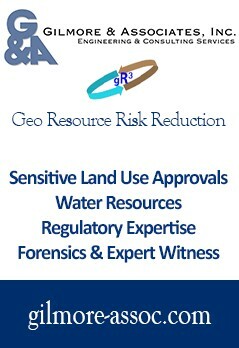 He also gave a dynamite presentation on the group at this week’s Marcellus Shale Coalition Shale Insight conference. Kevin shared a copy and we’re privileged to offer a pdf version here, but there are some highlights too importance to miss. Notice the radical Jacobin nature of the statement, which is intent on rejecting the Constitutional rights on which our nation is built. The CELDF is no ordinary environmental group. It’s not an environment group at all, in fact. Environmentalism is but the cover story. The idea is to create a new framework that makes every one of America’s tens of thousands of municipalities a separate nation. The intended result, of course, is chaos that will give CELDF types power. How? 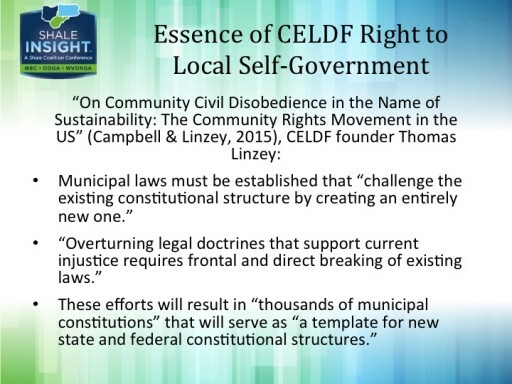 The answer, of course, is by bestowing rights on “natural communities and ecosystems” as “persons” and authorizing any resident or the municipality (represented by the CELDF) to enforce or defend these rights on behalf of the ecosystem or natural community. It’s a childish, yet insidious, scheme. The people of Grant Township, in other words, were used and manipulated to make a political statement they thought was about injection wells, but was really about advancing Tom Linzey’s revolutionary Marxist agenda. They were conned into supporting legislation clearly violating the Supremacy, Equal Protection, Contracts and First Amendment Petition Clauses of the Constitution as well as the substantive and procedural due process protections of the Fifth and Fourteenth Amendments. The pompous Tom Linzey, founder (with his girlfriend) of the CELDF straight out of college, giving a radical lecture on something he’s never done – productive work. I do solemnly swear (or affirm) that I will support, obey and defend the Constitution of the United States and the Constitution of this Commonwealth and that I will discharge the duties of my office with fidelity. This was a very good presentation that captures the radicalism of the CELDF. It is this extremism that needs more attention. Too many groups caught in local battles with the group fall for the con; that it’s about the bottled water, the hog farms, the timbering or the fracking. It’s not; it’s never about those things. Playing that game only empowers this dangerous threat to the republican model of government that has given America everything that makes it special. Benjamin Franklin wondered aloud if we could keep it and we have for two and quarter centuries. We certainly won’t, though, if we fall for the demagoguery and deceit practiced by the likes of the CELDF. 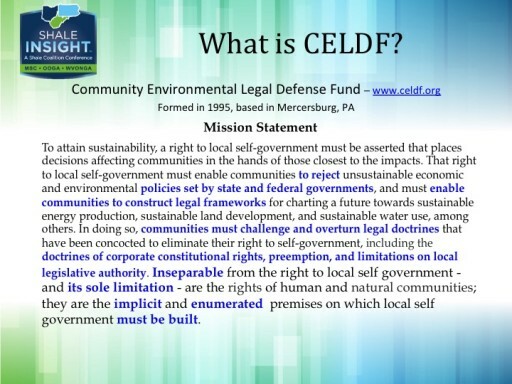 Like some parts of the antifracking movement cedlf is pretty radical and somewhat cultish. They have a little school named “democracy school” where one can learn their version of democracy even. Fascinating stuff. Speaking of somewhat cultish behavior “common dreams” has an interesting write-up today which according to common dreams is “progressive news”. I would say it isn’t news but does make for some interesting reading. There is an interesting link to a letter written by some union folks not opposing Dakota pipeline. FYI : the people mentioned in the common dreams article are significantly more influential than cedlf. As such a primer on this luminary Roseann demoro perhaps should be done? She seems to be the leader of a nurses union advocating not for nurses or her union or even higher wages but in the context of both Dakota pipe and natrual gas and fracking it appears to me that she seems to be under the impression that she is an expert on energy, the environment and a multitude of other things. Does she seem like someone one should listen to about a pipeline, all pipelines, natural gas, energy or the environment to me? The answer is no. I would not advise seeking out her advice or opinions on these matters period as you are likely to get a convoluted nonsensical and also misinformed opinion from her. She isn’t the only person however or group or org in that article I would say the same thing about. Seems to be a sideways attack on the Constitutional Structure in America – so are they really a progressive liberal organization? Replace current laws -with bigger govt control with them tell us what is right or wrong? 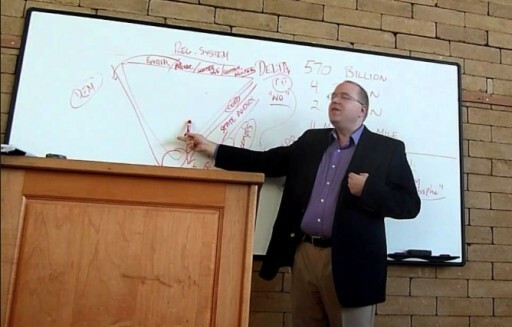 This guy is clearly a Saul Alinsky want a be.